I’m training for an Ironman…So why am I getting fatter? About a month ago, I took the plunge: I registered for a 2018 Ironman in Lake Placid, NY. For those of you unfamiliar with the insanity that is the sport of triathlon, an Ironman equates to 2.4 consecutive miles of swimming, 112 miles of biking, followed by a marathon run (yes, 26.2 miles). While this event is a whole new type of crazy for me, I’m no stranger to endurance racing. But despite my long history of running and triathlon-ing, I’ve noticed one consistent – though odd – side effect of training for my longer events: I tend to gain fat. A cursory Google search of “weight gain while marathon training” unveils hundreds of blog and magazine articles lamenting this very sentiment. Many of these articles suggest great solutions – meal prep, track your intake, track your energy expenditure, and watch the snacking. But most of these articles fail to take into account those of us who already take preventative measures and still see our jean size creeping up. Fewer still get to the bottom of why this phenomenon exists in the first place. 1. We overestimate our exertion. A famous study conducted at York University in Canada asked participants to run on a treadmill at light, moderate, and vigorous paces as defined by the explicitly-stated Canadian-established heart rate (HR) guidelines. The participants verbally confirmed understanding of the guidelines and expressed confidence that they could self-judge when they were within each of the pre-established zones. Researchers then measured their actual maximum HR and had them complete alternating periods of exercise at the light, moderate, and vigorous rates. Participants were abysmal at self-judgment. Almost 80% of participants who believed they were in the moderate HR zones were actually below the moderate threshold. Similar numbers of participants believed they were in the vigorous zone, but were in fact in the moderate zone (and often on the low side of moderate). The conclusion is that our perception of physical exercise (i.e. we think we’re working considerably harder than we actually are) poses a problem for meeting both weight-related goals and performance goals! 2. Calorie trackers overestimate calories burned per day. Compared to gold standard laboratory measurements of energy expenditure, wearables overestimate calories burned by about 300 calories on average per day, with some individual overestimations as high as 600 calories per day. While this may not seem like much, bear in mind that 3,500 excess calories translate to a pound of weight gain. If you’re overestimating calories by as much as 20% per day, that adds up quickly! This inaccuracy likely contributes to why those pesky extra pounds accumulate, even for those that closely track their calories in and out. 3. We underreport food intake. There is vast literature documenting our tendency to underreport how much we eat, even with the best of intentions. How many of you, like me, have ever enjoyed a cheese sample at Whole Foods or a pastry sample at a bakery? As much as we may wish they didn’t, the calories behind those little tidbits count, too. In fact, a number of studies have shown that it’s between-meal snacking, particularly those snacks that are rich in carbs and/or added sugar, that is typically underreported in food journals or calorie tracking apps. The upshot of this finding is not necessarily “track every crumb you eat,” but rather “be mindful of your intake.” Calorie tracking and food journaling are only two methods of mindful eating – and they’re not for everyone! But if this is a method you happen to use, accuracy of intake reporting is key to success. Here is an example of a long run and a typical 'reward meal' after. 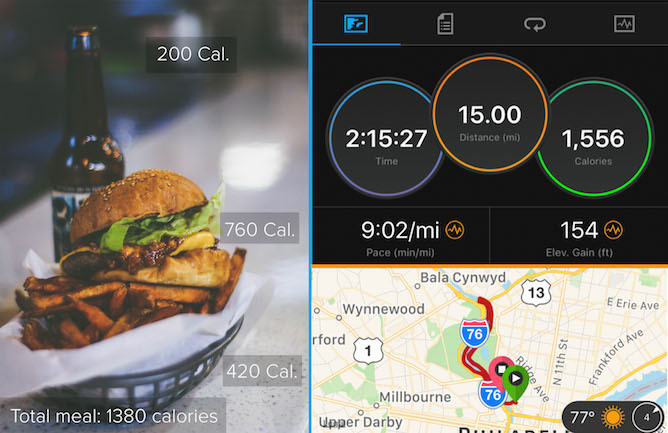 This single meal almost entirely eliminates the caloric deficit created by the run – and that’s assuming that the estimated calories burned is accurate to begin with! 4. We eat in the absence of true hunger. A study published in the British Journal of Nutrition in the ‘90s was the first to unveil this phenomenon. Participants were randomly assigned to one of three groups – a group who exercised vigorously, one that did so moderately, and another that did not exercise at all. After the exercise period, participants were asked to rate their hunger, but there was no significant difference between the groups. They were then invited to eat a buffet-style meal until sated, but there was no significant difference in consumption between the groups. Years later, a different researcher from the University of Ottawa replicated the prior study’s design, but with an important and telling modification –instructing participants to eat as many calories as they believe they burned with exercise. Participants in the exercise groups overate by ~300 calories despite no difference in physiological hunger. The story that this research tells is one of our hedonic hunger – craving for delicious, calorie-dense foods – winning out over our homeostatic hunger – the hunger that drives our consumption for utility rather than taste. With hedonic hunger “running the show,” we often use exercise as permission to eat all of the foods we normally wouldn’t – and we consequently overeat the caloric deficit we produced with exercise. How do we reverse this pattern? Although it’s easier said than done, the key is to view the exercise itself as the reward, not the meal after. When we view food as the reward for a hard or long workout, research demonstrates that we are far more likely to overindulge and eventually gain weight. 5. Our bodies adapt too well to exercise. Think about the difficulty of your first workout after a long hiatus compared to that same workout after weeks or months of consistency. The latter probably feels much easier. This is because the human body is masterful at adapting to challenging tasks. In fact, a 2016 study published in Current Biology suggests that individuals that exercise the most are no different from moderate exercisers in terms of calories burned. First, our metabolism compensates for extreme stress by constraining other types of expenditure. This means that when you do a really difficult workout, your body may burn many calories during your workout. But then, from an evolutionary perspective, the body must somehow compensate to prepare for potential future scarcity. In an environment replete with calorically dense foods, this evolutionary trait works in diametric opposition to our fat loss goals by slowing our metabolism for the remainder of the day, thus curbing the impact of our workouts. Second, our bodies adapt to our pace. When we initially begin exercising, we exert a great deal of effort to maintain a certain pace, and our physiology reflects that effort with a higher heart rate, higher systolic blood pressure, dilated pupils, etc. Over time, however, our bodies adapt to that level of effort and find it easier to achieve the same pace. This results in less energy expended during exercise -- especially if workouts remain unchanged despite increasing fitness levels. Introducing speed work, hill work and varying your workouts can help to combat this adaptation but will unfortunately never completely erase it. DO introduce variety into your training plan. Run hills, lift weights, or cross-train. It’ll keep things interesting AND continue to challenge your body. DON’T heavily restrict your intake. It will affect your energy and athletic performance. Besides, research shows that repetitive dieting results in injury and future weight gain – both consequences we’d rather avoid! DO seek out a nutritionist. Even a brief consult with a sport nutritionist can help you dial in on an eating strategy that will maximize performance and help you achieve your body composition goals. DON’T overdo the Gatorade, Gus, or other sport nutrition drinks/bars. The rule of thumb is to take in calories from food or sports drinks for ONLY those workouts that exceed an hour – otherwise, you’re consuming unnecessary calories and sugars where water would suffice. If it’s particularly hot or a very strenuous workout, consider Nuun or another calorie-free electrolyte replacement. In fact, avoiding unnecessary blood sugar spikes has more than weight implications; too much sugar intake during exercise may elevate risk for Type II Diabetes – even among super fit athletes! 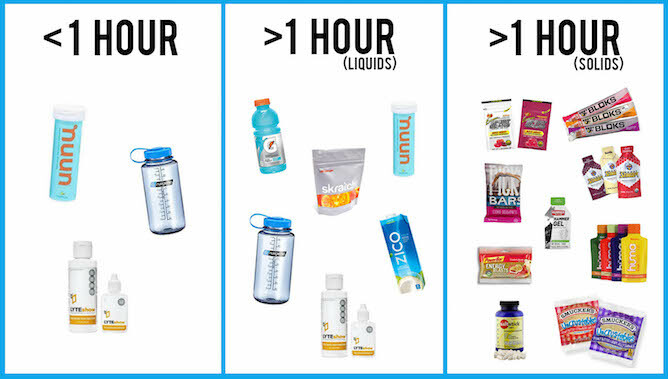 Here are some of the top nutrition choices for endurance athletes! There’s quite a selection (and really no right or wrong choices!) so just go with what works best for you. Remember: always try out your nutrition tweaks on your training runs, and never do anything new on race day! DO try to think of exercise as a reward in and of itself, rather than viewing it as a get-out-of-jail-free card for your weekend pizza-and-beer habit. DON’T fixate on the number on the scale. It will go up and down – instead try to measure your success through athletic performance, how your clothes fit, and most importantly, how you feel. DO keep at it and get on out there! Remember that every workout you complete does worlds of good for your body. Even if you aren’t losing the pounds or seeing all the changes you want, remind yourself that you are well ahead of the pack!